Well I'm back with another 'Joe re-draws his favorite comic characters in his own style' posts (I need a better name for these). I'm still sticking with the 'Scott Pilgrim' series of books (by Bryan Lee O' Malley), as there's such a huge wealth of interesting characters to choose from - and, well, I just like drawing 'em. 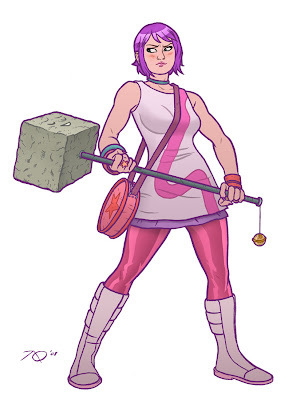 Anyway, here now is the titular characters' girlfriend- the über-hip, ninja-delivery girl, Ramona Flowers! Both of your SP tributes're awesome, Joe. Attitude! Glad you enjoyed SCF. Hope you're inclined to visit again next year. Really nice Joe. Though when I read Scott I always pictured Ramona as kinda chubby. I can't wait to see knives. Might I inquire as to what you used to ink this? Sure! A 'Pentel Pocket Brush Pen' (nigh indispensable) and a few FaberCastell's. damn, these SP sketches are so awesome.